The Elkay LRPBM28K Water Cooler is a two-level barrier-free stainless steel unit that has recessed in-the-wall refrigeration system and stainless steel grill. The Elkay LRPBM28K has a stainless steel tubular support arms incorporate unique recess to be integrated with basins. All stainless steel polished to lustrous satin finish with high shined outer edge. The Elkay LRPBM28K has contoured basins to minimize splashing, a Flexi-Guard® safety bubblers, easy to operate, fully functional vandal-resistant front push buttons, and a patented* valve and in-line flow regulators provide constant stream from 20 to 105 psi. The Elkay LRPBM28K has an energy efficient refrigeration system utilizes a combination tank continuous-tube type evaporator, refrigerant drier, and capillary tube. Note: Minimum 40 psi supply line pressure required in special circumstances where both sides of bi-level are in use simultaneously to ensure adequate stream height. Use of water filter in this situation is not recommended. The Elkay LRPBM28K comply with the requirements of A.D.A. (Americans with Disabilities Act) when properly installed. Also meets the guidelines for children's environments providing the floor to orifice height is 30" or less and proper clear floor space is provided for parallel approach. (Based on Architectural and Transportation Barriers Compliance Board final ruling.) Check Local and State Codes. 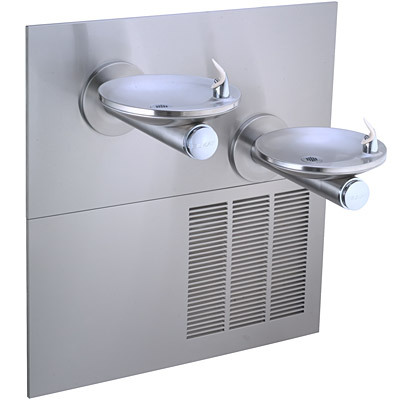 The Elkay LRPBM28K is certified to be lead-free as defined by the Safe Drinking Water Act. Elkay Water Coolers are manufactured with a waterway system utilizing copper components and completely lead-free materials. These waterways have no lead because all lead materials, such as leaded brass, have been removed. All joints are brazed using silver solder only. No lead solder is permitted. A strainer with an easily cleanable screen is provided to allow trapping and convenient removal of waterborne particulate of 140 microns and larger prior to their entry into the water cooler. The Elkay LRPBM28K is equipped with the WaterSentry® VII Filter System, which is tested and certified by NSF International. The WaterSentry VII Filter System reduces cysts such as cryptosporidium and giardia by 99.99%. Tested to ANSI/NSF Standard 53 yields a reduction of soluble and insoluble lead content to less than 0.015mg/l. This translates to lead reduction levels of 93% to 99%. Class 1 particulate reduction as tested per ANSI/NSF 42. Removes over 97.5% of free available chlorine which provides Class 1 performance as tested to ANSI/NSF 42. Provides taste and odor improvement. Elkay recommends that you replace this filter annually. Hermetically sealed, reciprocating type, 115V, 60 Hz single phase. Sealed-in lifetime oil supply. Equipped with electric cord and three prong molded rubber plug. Combination tube-tank type. Self cleansing. Tube portion is continuous coil of copper tubing. Tank is stainless steel. Fully insulated with EPS foam which meets Underwriters Laboratories Inc. requirements for self-extinguishing material. #18 gauge, type 304 nickel bearing stainless steel basin polished to a lustrous satin finish with high shined outer edge. Contoured basin offers large strike area to minimize splashing. #16 gauge, type 304 tubular support arm incorporates unique recess to accept basin. Fully functional vandal-resistant push button is easy to operate. Made of type 304 stainless steel, polished to a uniform Elkay satin finish. Removable louvered ventilating grill encloses refrigeration unit and plumbing. MF100 frame furnished with each unit. Frame allows flush mounting to finished wall.